Fifty years of helping Vineyarders find home. Tea Lane Associates, which is celebrating its 50th anniversary this year, is a real estate brokerage firm with offices in Chilmark and West Tisbury. It represents properties in all six Vineyard towns. The business was first established in 1967 by Julia Sturges and Eleanor Pearlson. 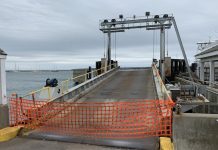 The two women moved to the Island from New York City, where they had both worked for the Henry Street Settlement, a well-known nonprofit agency on the Lower East Side of Manhattan that provides social services, arts programs, and healthcare services to New Yorkers in need. 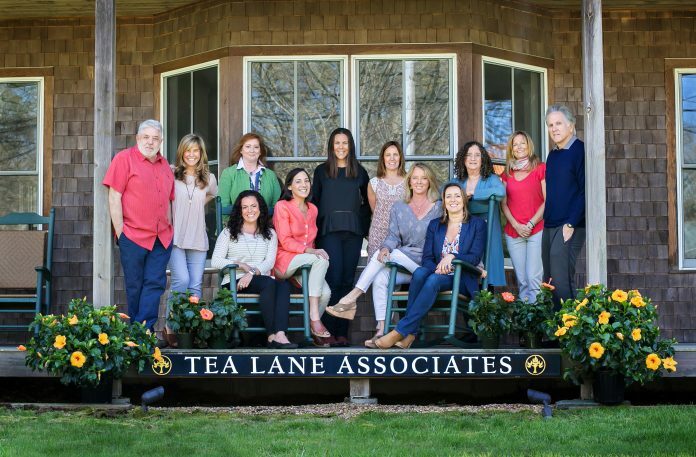 Tea Lane is now owned by Ms. Pearlson’s nieces, Abby Rabinovitz and Leslie Pearlson, who along with 10 other brokers make up the team of full-time agents. The Times talked to Ms. Rabinovitz, principal broker and owner, who emphasized that she and her cousin Leslie, broker and co-owner (also quoted here), are partners and part of a fully integrated team of professionals who work together. How long have you been involved in the business? I started working for the company about 20 years ago. I came to the Island initially just to help my aunt, but I ended up staying. I think between myself, Leslie, our general manager Selena Roman, and the agents at Tea Lane, we took what was a wonderful company and built on it. We kept the things that were really great, but also kept it current with the times. We continue to learn and evolve. I was a professional musician for 20 years. Before moving to the Vineyard, I taught at New England Conservatory in the Contemporary Improvisation Department. I performed and composed music — primarily jazz, world music, and klezmer music. In my life prior to music, I was a tenant organizer in Somerville. I never thought I would own and run a real estate company! Leslie Pearlson: I taught for six years at Arts High School in Newark, N.J., a magnet school that had a wonderful collection of talented students who pursued art, music (vocal and instrumental), dance and filmmaking. I loved my students and the experience, but I was ready for a new chapter in the spring of 2002 when Eleanor invited me to come up and join the team. Since I grew up visiting and enjoying her “cast of characters,” it seemed natural to head to the Vineyard. I was born in New York City, and grew up in New York State. I’ve been coming to the Vineyard since I was very young — visiting Eleanor and Julia. What makes Tea Lane unique? We have deep roots on the Island, stretching back 50 years. Leslie and I are committed to maintaining the close connections to the community that Eleanor and Julia established over the course of their decades here. We are part of a larger team, and all of our agents have their own connections and relationships that they draw on. They each bring their own unique experiences to the work, having backgrounds in diverse fields from investment banking, finance, and insurance to education, philanthropy, and the arts. People work as a team and support one another. That’s something that I find very special. I also think that the professional expertise our agents bring to the table is unique. We are a really strong, experienced team. Tell us a little about your aunt and her partner. They were amazing women. Julia came from an upper-crust New York family, prominent in the hotel industry. She raised her children in Princeton, and summered on Shelter Island, but moved to New York City after her divorce. She was a very independent woman in her well-spoken, refined way, who lived sort of outside the mold, and she was also socially aware and very committed to helping others who were less fortunate than herself. She ended up on the board of Henry Street Settlement, where she also volunteered teaching piano to children. This was the ’60s. Eleanor came from an Eastern European Jewish immigrant family without much money, and grew up in Inman Square in Cambridge. She was incredibly independent, and known for speaking her mind. She was one of the first women to serve in the WAVES in World War II. When she got out of the service, she went to New York City, where she got a job as the executive secretary of the Women’s Trade Union. Later she became the executive secretary at Henry Street Settlement. That’s where she and Julia met. 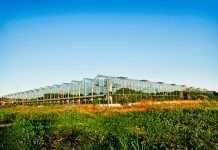 What makes having a business on the Vineyard unique? It’s a small, tight-knit community. That makes working on the Vineyard very different from if we were doing the same thing in Boston. I much prefer doing business here. Not only because the Island is so beautiful, but also because there’s a connection and an intimacy in knowing the people you work with, and by that I mean clients and colleagues, as well as other agents and brokers. Being in real estate here is about building longstanding relationships with buyers and sellers, owners and renters. It’s very gratifying to know that we’re going to continue to see and interact with the people we’ve worked with. They’re going to be part of our lives. We want them to be happy in their new home and in their community. I know that it’s important to Leslie and myself, and to every person who works at Tea Lane. In what ways have you carried on the tradition of the founders, and in what ways have you evolved? 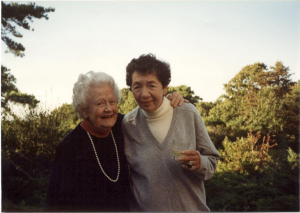 Eleanor and Julia loved people, and they thrived on making connections That spirit is what has made the company what it is today. There is always the challenge any company faces, that you have to grow along with the times. You have to acknowledge that new technology is here, and you have to be constantly making changes. We need to keep things current, and we’ve grown from just the two of them to a team of 12 outstanding professionals, but we also recognize that there was something very precious about the way the two of them cared about relationships and people. There’s nothing more basic for a business than caring about the people you’re serving. You can add a lot of technology, but at the end of the day, it’s a very personal business. Do you meet people who remember your aunt? All the time. They both touched a lot of people’s lives. People come up to me and say, I knew your aunt. I got my first house because of her. I got my piece of land because of her. Or she and Julia helped me get a green card. They were always helping people. That was just who they were. What are some of the challenges to the work that you do? People in real estate work really hard. It’s not one those jobs where you can turn it off at 5. If you are going to do it well, you have to be prepared to provide the support and services that your clients need. You have to be very knowledgeable and on top of the market. People sometimes think that you wait for a phone call and then you show up and sell the house. I’ve never had a sale like that! There’s so much that you have to know that goes into a sale … information about the property, zoning regulations, the market, and so much more. A good agent has a depth of experience that they can draw on to guide their clients to the place they want to go. A good agent knows how to listen as well as advise. That’s where your real value comes in. What attracts people to move to the Vineyard or buy a second home here? For those people who choose it, it’s a very special place. Besides the natural beauty of the Island, we have a wonderful community here. I think the Vineyard has always had a very interesting mix of people, and it still does. 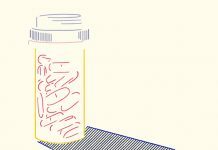 And there’s so much going on — arts, intellectual pursuits — these things are happening all summer, and year-round as well. We work with a very diverse clientele — people who are selling high-end homes and people who are selling homes that might appeal to year-rounders. We work with buyers and sellers at all price points. That’s what makes it gratifying, because it’s wonderful to sell a beautiful estate vacation property, and it’s equally wonderful to sell a home that a year-round family is going to love.